I’ll start with St. Francis de Sales, patron saint of writers (particularly journalists) and teachers. Francis was a 16th-century Frenchman whose aristocratic family had intended him for politics, but he had a strong religious streak in him and in his early twenties he gave up law and politics and entered the priesthood. Francis was my kind of guy, actually: He began his religious life in a dark mood, believing for a while that he had been predestined for Hell. Then, through a lot of study and meditation, he came to view God as manifested love, and he devoted his life to compassion, teaching and writing on Christian love extensively. On a more personal note, I hold this gentle saint in esteem not only for his combined patronage of writing and teaching, but also because he’s a patron for the deaf — in fact, he used a form of sign language to preach to the deaf so they wouldn’t be denied the teachings of the church. This is in the 16th century, mind you! My own father has severe hearing impairment, spent most of his life wearing a hearing aid and has in his old age bumped up to two hearing aids,* so I have a special place in my heart for anyone — especially a writer and teacher — who looks out for the hard-of-hearing. 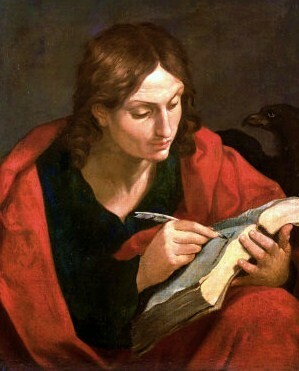 The second Christian saint I revere is St. John the Apostle,** author of the Book of Revelation (talk about a dark mood!). I mention St. John not as much for his authorship, though, as for my own connection to him: I’ve been to the Basilica of St. John and John’s tomb in Ephesus, Turkey. More interestingly, tradition has it that Jesus appointed John guardian of Mary, the Mother of Jesus, and that Mary accompanied John to the Anatolian peninsula. According to some stories, Mary actually died in Ephesus, and there is a small devotional chapel, the House of the Virgin Mary, built on a hill just outside Ephesus, that allegedly marks her last place of residence on Earth. No religious governing body has officially confirmed it as the final home of Mary, but the Catholic Church has named is a Holy Site, and the little chapel remains an important pilgrimage site for Christians and Muslims alike. I’ve been in the chapel, too. Both it and the Basilica of St. John are deeply spiritual places that were among the highlights of my trip to Turkey a dozen years ago. As a Buddhist student of compassion, I have learned to think of all living beings as my mother, as an exercise in developing compassion. And the majority of the world views Mary, the mother of Jesus, as the greatest and purest archetype of motherhood. So, for looking after Mary until her death as well as writing one of the most complicated symbolic religious (and political) texts in the world, I tip my hat to St. John the Apostle. * EDIT: My dad read this post and emailed to tell me that A) he’s not “in his old age,” he’s middle aged; and B) one ear has now been deemed “helpless” so he’s back down to one hearing aid. Thanks for the updates, middle-aged Dad! ** John is a highly controversial figure. It’s unclear, really, if the same John who wrote the three epistles attributed to him also wrote the Gospel of John, or whether either of those Johns also wrote the Book of Revelation. Tradition says they’re all the same guy, but modern scholarship has turned up too many discrepancies to make that assumption. It’s also unclear whether John actually took Mary with him to Ephesus, since another tradition has her dying in Jerusalem. I choose not to get involved with those controversies here, so for the sake of John’s writing patronage, I’m going with tradition and am describing only why certain stories about John appeal to me. You mean WordPress? Depends. WordPress.com is free–just sign up and have at it. WordPress.org is a little more flexible and comes with your own domain name, but you have to pay for the perks. If you look in the bottom-right corner of my site, you’ll see a link to WordPress–just click that and work from there.